NEW ORLEANS (AP) - The dark blue rescue van pulls up in front of a sad shell of a house, a few blocks from the police station and criminal court. It's turning into a cold January night. Slipping on gloves, social workers Mike Miller and Katy Quigley head in. "Homeless outreach! Anybody home?" Miller shouts as he climbs over a balcony and up a flight of stairs. No one's home. But the signs of life are disturbing: A slept-on mattress, bits of food, smells of urine and feces. It's creepy: The upstairs apartment hasn't been touched since Hurricane Katrina. There's paperwork, letters, clothing, medicine bottles, a child's stuffed animal, a Star Wars X-Wing fighter plane on the carpeted stairs. A business card they left on the fetid mattress during their last trip is gone. That's a good sign. At an abandoned 100-year-old factory, they find a few squatters. The factory has become a spot for day laborers working for temp services, restaurants, construction crews. The wages and tips, plus side tricks like collecting aluminum cans, aren't enough to get them into an apartment since rents skyrocketed after the storm. Quigley pauses outside a room overlooking the factory floor. "On New Year's Day a guy was hit by a cab and killed on Claiborne and Gravier on his way to his temp job," she says. "He lived right here." In a former workers' locker room, James Bragg, a 35-year-old out-of-work carny from Illinois, is buried under blankets with his girlfriend in the dark. His left eye doesn't blink; it's bruised and bloodshot from being hit with a pipe. When the carnival season ended, he said, "We come down here with about $600." But he was robbed on Bourbon Street, and after they ate through savings living out of a hotel before they came across the factory in a downpour of rain a few months ago. "It's better than sleeping on sidewalks," he says. An ex-convict from New Orleans lives in the next room. He's arranged his living quarters like a prison cell - neat and tidy and cold. He's lined up hand sanitizer, hair lotion, a broken mirror to shave in, water jugs, stacked clothes - one stack for boxer shorts. A hole in the floor looks onto the ground floor, and he uses it as an outhouse. Enter America's Queen City of Blight. More than five years after Katrina, New Orleans is struggling to deal with about 43,000 blighted residential properties - in various states of neglect and collapse. 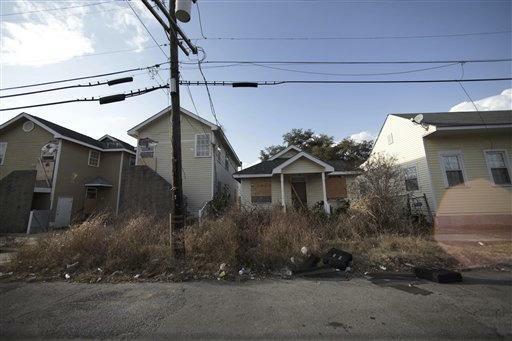 The city has a larger percentage of blighted properties than any other U.S. city, about a quarter of its housing stock. And in these wastelands, an estimated 3,000 homeless find refuge every night. They are wretched people suffering from mental illness, disability or substance abuse, or simply down-on-their-luck working poor. They can be found sleeping in schools, rundown shotgun-style houses, warehouses, sprawling factories and even funeral homes and hospitals. UNITY of Greater New Orleans, a collaboration of 63 homeless agencies, has been running sweeps across the city every week for more than two years looking for "the sickest of sick puppies," as Miller puts it. "Worked someone out of there, someone out of there," Miller says, pointing as he drives through Mid-City. "It is every neighborhood in New Orleans: People living in abandoned buildings. There's not one neighborhood where we haven't pulled someone out." Miller, a 31-year-old part-time bartender and street-smart transplant from Illinois, and Quigley, a 52-year-old mother who's worked much of her life with the poor and homeless with HIV and AIDS, sit in the front van, smoking cigarettes. They scan the streets for homeless and swap stories about people sleeping under piers on the Mississippi River or in the shadow of the cathedral in Jackson Square. One guy fell off a 10-foot scaffolding. Another refuses offers for housing after 20 years on the streets. There was a man they found in a house who'd been drinking antifreeze for four days in an attempt to kill himself. "Now's he's with Volunteers of America. It's kind of cool. An older guy," Miller says. "But we haven't found anyone dead ... which is good!" Decades of poverty, the trauma of Katrina, the economic downturn and the oil spill in the Gulf of Mexico are a toxic socio-economic cocktail that has made the reality of dire homelessness stubbornly vivid here. With about 11,000 homeless, New Orleans has the nation's highest number per capita, according to UNITY. New Orleans, enjoying three solid years of growth and excited by rebuilding successes, was stunned back into its homeless crisis just after Christmas. On Dec. 28, 2010, eight squatters - a collection of train hoppers and travelers - died inside an abandoned rail-yard warehouse, asphyxiated by carbon monoxide fumes and burned when a fire they'd built to warm themselves went out of control. "The homelessness here does seem very Third World, and that shouldn't be happening in America in 2011," said Martha J. Kegel, the executive director of UNITY. "I am just horrified by the magnitude of the problem." In the wake of Katrina, New Orleans became a laboratory for many things - urban planning, eco-friendly building, school reforms, community-driven politics, volunteerism, adaptation to a world facing global climate change. But social workers and homeless advocates say an opportunity was missed to make New Orleans a laboratory for ending homelessness in an American city. Overnight, a majority were left homeless by Katrina, which struck on Aug. 29, 2005. It took Congress until the summer of 2008 to give the New Orleans metro area enough money - funneled through a Department of Housing and Urban Development voucher program - to house 875 of the most vulnerable people living on the streets. By then, tent cities had sprung up in front of City Hall and along Canal Boulevard, the city's main thoroughfare. "There was a lot of hope at the beginning (after Katrina) that since everyone had left the city, that we could prevent the recurrence of homelessness at all as people came back," said Nan Roman, the head of the National Alliance to End Homelessness. Not enough was done, she said - "not what we had hoped, something like a game changer. That didn't happen." Meanwhile, rebuilding programs for renters have languished, as has the construction of cheaper housing. In addition, mental health and health care services remain crippled. "The magnitude of the problem calls for a muscular response, but that hasn't really happened," Kegel said. "It's a shame that we're still having to do search and rescue for homeless in abandoned buildings five and a half years after the hurricane." And the homeless numbers are creeping back up due to the economic downturn and oil spill. "There are a number of first-time homeless people out on the streets now, probably the most we've seen since Katrina," said Stacy Horn Koch, an advocate hired last month by Mayor Mitch Landrieu to tackle homelessness. The city gets about $15 million a year from HUD to help the homeless, and $7 million for homeless programs was made available through economic stimulus funding. But some targeted funds are drying up. More than 500 of the 875 special HUD permanent housing vouchers have been used. Once they're gone, a door will close on housing the most desperate. "It's harder and harder to get funds for the long-term recovery," Kegel said. The UNITY van pulls up to a boarded-up hotel where they'd discovered a couple living on a previous outing. Kenneth J. Wilson, a sheetrock painter whose employment surged after Katrina before petering out, and Venus Green, an out-of-work nursing assistant, greet the social workers with weak smiles. They've been at the hotel for about a year, and she's now pregnant. "Before the storm, I was working, I had my own place. I was doing good," Green, 32, says. "After the storm, I gave up." The UNITY team spends about a half hour with the couple filling out paperwork to help them get into housing. Quigley brings them some extra sleeping bags. The small room has no heat. Still, it kind of feels like home with photos of family next to the queen bed, an Oriental rug, an electric cooker and New Orleans Saints memorabilia hanging from a light fixture. Green feels that a real home will set things straight. "Once I get a place to stay, it will be easier for me to get a job and stuff," she says. "I can't put this down for no address." In the 8th Ward, the van parks behind the abandoned Oretha Castle Haley elementary school, named for a civil rights leader. "Hello! Hello! Homeless outreach! UNITY! Anybody home?" Their voices echo in pitch black stairwells, corridors and class rooms. Debris covers every floor. Chalk boards are scrawled with graffiti. The school is used by travelers like the ones killed in the warehouse fire. They're gone now, leaving behind malt liquor cans and tobacco pouches. In a classroom, a newspaper article about the deadly warehouse fire hangs on the wall. During the day, the UNITY crew had found a drug cooker and syringes, and also evidence of a woman living with a dog in an office. But she's not around. They hope for better luck with a young woman they've been told is living in a squat next to the train tracks where the eight travelers were killed. Apparently, she was part of the group. They park near a memorial to the fire victims. Occasionally, trains whistle. Down the tracks, their flashlights pick out someone sleeping on the ground in an abandoned warehouse. He's got a dog with him. Victor Fitzsimmons is 22, from Wisconsin, and has been hopping freight cars for the past year and a half. He says he was in the Marine Corps in Iraq. He shivers at the thought of the warehouse fire and the victims, whom he knew. "That right there," he says, pointing, "is the grill they took inside." The UNITY searchers move on. In a supermarket parking lot, they find Charles Arceneaux Jr., a 53-year-old diabetic living in a Grand Marquis car. After Katrina, his leg got infected and was amputated. The only good thing about the cold is that he doesn't have to worry about his insulin spoiling. "I am hoping that by the time things get really, really warm, I will be situated," he says. More paperwork: He's got a good shot at housing. The van heads to an abandoned house near St. Bernard Avenue where a pastor has told them about a man living in a Katrina-wrecked house. It's past midnight when they find it: Broken windows, roof in tatters, missing doors, a deadness. A skinny, ethereal man appears out of the gloom, and beckons them to his side of the house. A fetid stench overwhelms the social workers when he opens his door. Trash covers the floors. The 43-year-old man tells them he suffers from epilepsy and sickle-cell disease. Before the storm, he lived with an uncle in the St. Bernard public housing project, but that was razed. He says his family "is out of town right now, ever since the hurricane." A friend owns the house and has let him stay in it for the past two years. Back in the van, Quigley says, "This is exactly what we're after." With no income, no food stamps, and no one even aware that he's homeless, "he needs case management badly to help him survive." The van moves on to an abandoned house, filled with gut-wrenching filth, that they'd visited earlier. Miller tries the door, but it's locked from the inside. He peers through a broken window and sees a shape on the floor. "This is Mike from UNITY." "I heard ya. Go away!" a man groans back, wasted. "You want me to come back tomorrow. What time?" "In the afternoon, man, leave me alone." "Who'm I asking for? Can I leave a card? OK? Who'm I leaving a card for?" Silence. "OK, my man, I'm going to put it in the door for ya. You alright for now?" For tonight, the search and rescue comes to an end.